Funky, groovy, bluesy... these terms haven't usually been associated with the ukulele -until now! 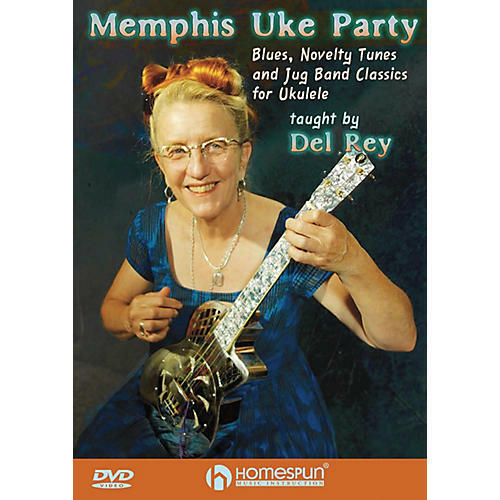 Del Rey makes the uke the coolest instrument around with her versions of blues and jug band tunes from Gus Cannon, the Memphis Jug Band, Frank Stokes, Bo Carter and other giants of '20s string band music. Songs: Satisfied · Tired Chicken · Bottle Up and Go · Tappin' That Thing · The Lord's Gonna Step on You · Downtown Blues #2 · No Junk Out of You. Early intermediate level. 1 hr, 30 min.